HURRAY FOR RALLY, BOOK THREE! RALLY ON, MY FRIENDS! Rwhen, after being offline for so long due to the move, I need to do some serious re-reading to get myself up to speed. And franky, I just don't have the time for it right now. So, please, go ahead and post. Fangorn sounds good. I'm sure Sfatha will feel more comfortable there, and our battle-weary crew could sure use a break! Okay in my last post I asked if you, Sunny would like me to have the Ents move your three to Fanghorn. And I asked Sandra if she thought it would be okay to wake up Oreo now. Nice clean new home here. I am nominated this thread for best RP and also for best fight scenes. Hello Rally!! Sory for my absence of late, I lost my job and for awhile the internet was a luxury that I could not afford. Peace to all of you and Hoorah for Rally 3. Sandy, I expect a poem is in order!!! I'm very sorry to hear that, Oreo. It sounds like you have service back now, though, is that correct? How goes the job search? I think this thread just might win a White Council award this year. It certainly deserves one, IMO! Have you seen the nomination thread yet? Great to see you back Chris. So many folk are losing their jobs lately. I do hope you find another quickly. Its good to Rally up for an award. Its only taken 8 years to do it! OREO!!!! I was just about to abuse you in thread. Glad you are back and can abuse yourself....wait!! That just sounds wrong. Yes, Hunter, myself and Gil have nominated the thread.....so we will be nominated, even if we don't win. But I think the battle scenes that have been nominated are pretty raw...they SHOULD get attention and recognition. Soon....work has been keeping me extremely busy this week!! OroSand, could you edit the link to the previous thread into the first post? Makes it easier to look over the storyline, as I need to do before I can post. I'm on 7 weeks leave! This means I'm going to be able to post! Have to read up first, though. Hello and welcome back Novice. 7 weeks leave. How did you manage that? 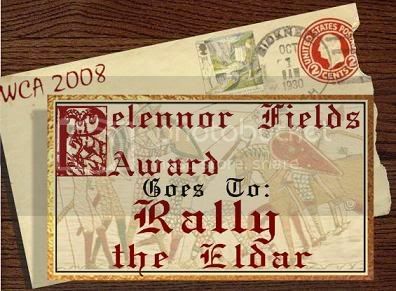 I am hoping that people from Rally will show up, who knows we may have won an award this year. The thread is nominated for best fight scenes and Tempest for best RPer. Show up to support Rally!!! Good luck to all who were nominated! Tempest is definitely crashing the WCA. In fact, she's even thinking of setting the place on fire. Ah HA. Well enjoy Elton John....I think I would miss the WCAs for that too. rwhen wrote: Good luck Tempest!!! She certainly would not be the first, now would she. Well guys, WE DID IT!!! Anyone know if Orodreth has been around lately? Someone should give him a shout, and let him know! Last edited by Sunsilver on Tue Feb 17, 2009 1:18 pm, edited 1 time in total. CONGRATULATIONS to Rwhen, on winning the Arpy, the Dernhelm, AND the Lifetime Achievement award! It was a huge night for sure. You don't know how glad I was to see you show up Sunny. My night was crazy enough as it was. Erinhue was just about to accept on behalf of the thread and then you posted. I was THRILLED to see you there. Congrats to everyone on Rally....and Tempest you really write an awesome character!! Thank you Sunny. Again, it was quite a night. Long ...very long. But I am overwhelmed to be honest. So thanks. I am still here, minus a muse at the moment it seems. I have been looking high and low, I think she is in Jamaica the minx. I shall hunt her down and get back in here. Oreo???? You back with us now? Sure hope so. You have been "sleeping" for a VERY long time. Yes, I'm back. Gotta do some reading but I will try to post this week. What has happened to us? We used to be so full of fire and energy, but now we've become a dried up and barren wasteland, filled with broken dreams, and broken people. Greetings, fellow Middle Earthians. ^,^ You guys wouldn't happen to have any room for another, would you? It maybe beneficial to you to read the last few pages of Rally 2 (link in the first post here) to get an idea of the story. Your request is granted. I am forwarding by e-mail right now. Beware though, its quite large and may go to a bulk folder. We are currently in what is known as a Rally beer break, although I feel confident that we will resume RP shortly.